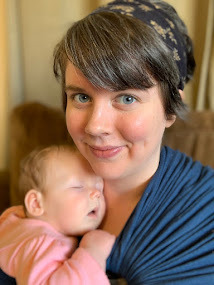 We've been parents for about three months now, and while that hardly makes us experts, I have to share our experience- thus far- with cloth diapers. I've always been passionate about the money-saving, anti-consumerism, pro-environment-conservation mission behind cloth, and I'd planned to forgo wasteful, chemical-laden disposables with my future babies long before I ever actually got pregnant. But. You never know how something is going to go until you try it for yourself. 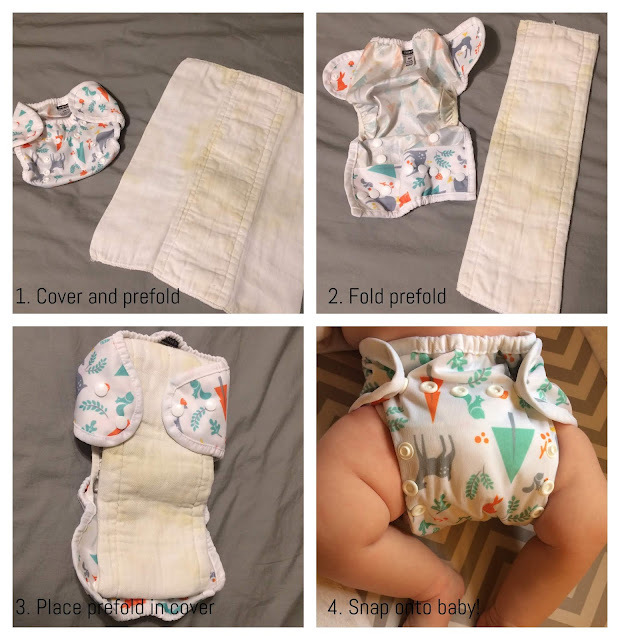 When I did get pregnant, we received so much negativity, doubt, and skepticism from family and friends upon sharing our diapering plans that I began to grow doubtful myself. And the research I'd done online was a tad overwhelming, to be honest. It seemed like there was a learning curve with cloth diapers, and a whole new set of lingo to learn (What the heck was a prefold? A flat? An AIO?!?). 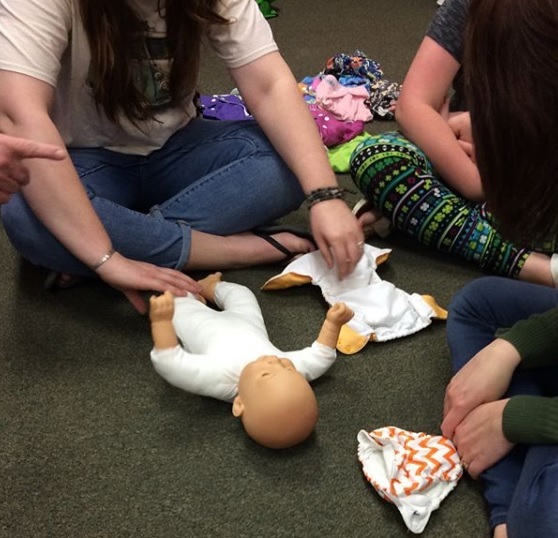 It all sounded a little too complicated, maybe a little too much work, until we went to a cloth diapering class. We had an excellent, hands-on teacher in a small class of four students (Matt and I included). She explained the confusing vocabulary, passed around examples of every kind of cloth diaper out there, then sat with us in the floor, showing us step-by-step how to put cloth diapers on baby dolls until we felt like pros. The other friend sucked me deeper into the world of cloth by convincing me to use cloth wipes. I'd planned to use disposable Water Wipes . I hated that we'd be generating more waste, plus that would be one more thing we'd have to shuck out money for regularly, but adding cloth wipes into the mix seemed like more work. But, as she told me, you're already doing laundry anyway. All you have to do is toss the wipes in the pail with the diaper at each change. It's no big deal at all. Seriously. It's so simple. If you're already using cloth diapers, paying for disposable wipes is ludicrous. Now that I've rambled a bit, I'll break it all down and show you exactly what's been working for us so far. Get ready to immerse yourself into some cloth diaper lingo. Our diaper stash consists of an assortment of covers and prefolds as well as all-in-one's. A cover is a waterproof shell that closes with either snaps or Velcro over a prefold. A prefold is a removable, thick, absorbent cloth that goes against the baby's skin inside the cover. I took some pics for reference, so see below. This is the Thirsties Duo Wrap cover and a generic used prefold . 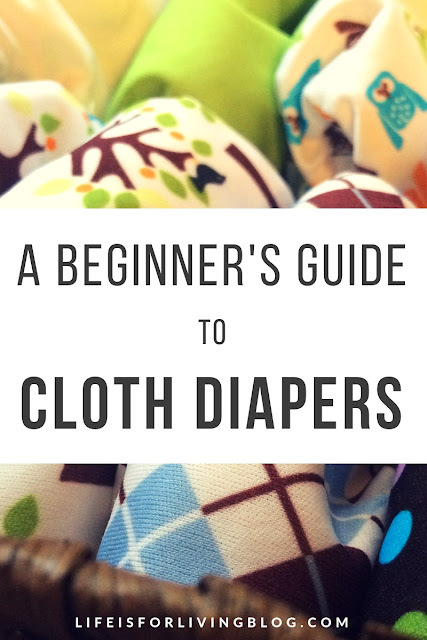 Covers and prefolds are the least expensive cloth diapering option (aside from the old-timey method of flour sack towels and safety pins, which you can totally do if you want.). One nice thing about the cover/prefold combo is that, since covers are waterproof, if the baby only pees in the diaper, you only have to remove the wet prefold, wipe out the cover, and put in a new, clean prefold rather than putting on a whole new diaper. Since prefolds are so cheap, you can really stretch your dollars this way. This is much unlike an all-in-one (that's AIO stands for!). An all-in-one is what it sounds like; a cover and prefold in one piece. They're just like a disposable in that all you do is lay the baby on the clean diaper, snap/Velcro in place, and take the whole thing off when it's dirty. No folding/inserts necessary. Super simple. Right now, we're keeping a total of 3 covers, 12 prefolds, and 12 all-in-one's in rotation. I can typically get away with doing diaper laundry every two or even three days at this point, but it can differ from day-to-day, of course, as the baby might go through more or fewer diapers in any given 24 hours. So far, our absolute favorite diaper is the Thirsties One-Size All-in-One . We only have two of these because they're pricey, but they're amazing. On the rare, wonderful nights when Claire sleeps 8+ hours straight, she's always wearing one of these diapers. It's the thickest, softest, most absorbent diaper we have used, which makes it perfect for overnight wear. Matt and I have both noticed that, even after wearing it all night, Claire's skin isn't red or irritated in the morning when we change her. And "Stargazer" (pictured below) is pretty much the cutest pattern ever. Also, this diaper is a one-size, which means that you can adjust the snaps to make the diaper fit a smaller or larger baby (see below). You definitely get a bargain with a one-size because the diaper grows with your child, all the way from birth to potty-training! All of the diapers we've tried so far are from Thirsties, so I can't compare them to any other brands. But as these have been working well, I can recommend them. (BTW, I'm not getting paid for this recommendation, sadly. But Thirsties, if you're reading this, we should really discuss compensation, lol). 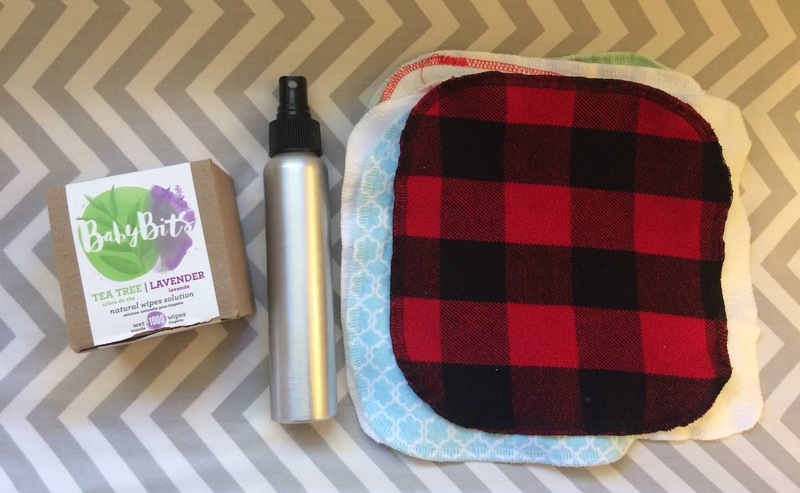 Our wipes are from several different brands, but all of them are soft flannel (to save money, you could upcycle old sheets, towels, t-shirts, or any other soft fabric you have on hand. Considering you're only gonna use it to wipe a little baby hiney, there's zero shame in this.). Some people keep their cloth wipes in a wipe warmer with some water, but that takes up more space and requires purchasing a wipe warmer. We just keep our clean wipes in a stack, grab one when we need it, dampen it with a few spritzes of Baby Bits , wipe baby, and toss into diaper pail. I can't believe I thought that was too complicated. Let's talk about BabyBits for a moment. 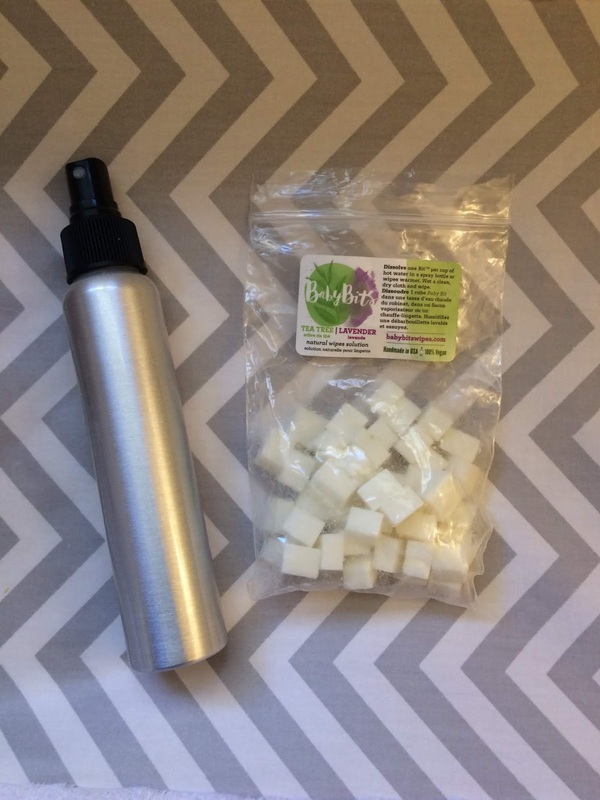 It's a natural wipe solution that comes in dissovable cubes. They're made with essential oils and no shady chemicals (unlike most commercial wipes), so they're great for sensitive baby skin. A single box is only $11.00 and will probably last longer than your baby will even be in diapers. To make the BabyBits solution, you simply dissolve one cube into 8 oz. hot water and store in the dispenser of your choice. Wanting to avoid plastics, I found a set of three 4 oz. aluminum spray bottles on Amazon for $8.99 (one for the changing table, one for the diaper bag, and an extra for household use). I've been cutting the cubes in half, dropping the half into these 4 oz. bottles, filling the bottles with hot water, and shaking them up until it dissolves. Very important: you cannot use mainstream, petroleum-based, diaper rash ointments with cloth diapers! It will damage them. But, because cloth is awesome, you probably won't be dealing with much diaper rash; it's primarily caused by the chemicals and dyes used in disposable diapers. Disposables wrap the most sensitive body parts in plastic and other man-made materials, so that's going to cause skin breakdown, too. Of course, you will run into some irritation with cloth, just because any type of diaper is going to hold urine or feces against the skin for some length of time (using the wrong detergent can cause soap buildup that can irritate skin as well). We had the Grovia Magic Sticks on our baby registry because we'd heard good things about them, and they're great when Claire gets a little redness. But truly, good ol' coconut oil works just as well for a fraction of the price (we get organic coconut oil at Aldi for less than $5). Aside from being inexpensive, plant-based products like these are so much better for our skin than petroleum-based creams and gels (I mean, just think about what else petroleum is used for...). One big concern I had regarding cloth diapers was the smell. You can't just wad them up and throw them in the garbage when they stink, right? You have to put them somewhere in your house until you have amassed a pile large enough to wash.
My friend Anna gave us the Ubbi diaper pail and Planet Wise reusable pail liners that she used with her daughter, and let me tell you, the combo is pretty amazing. You just open the pail, put the pail liner in (it's basically a big cloth trash bag that you wash instead of sending to the landfill), and throw in your diapers and wipes. When it's full, you pull out the pail liner and toss everything, liner included, into the washing machine. When the lid is closed, you honestly cannot smell anything. I know this is true because when wash day arrives and I open the lid and pull the bag out, the nursing-home-like odor of stale urine and sour baby poo takes my breath away. In those moments, it always amazes me how well the pail contains the stench. You really only need two of these; one in the pail while the other is in the wash.
On that note, let me explain my very lazy washing routine. I lug my liner full of smelly diapers into the laundry room, dump the contents into the washer, turn the liner inside out, drop it in as well, and wash it all on hot with Ecos Free & Clear detergent (and sometimes a little vinegar if the smell is particularly stout). Then I dry them in the dryer on low. Also, we learned in the diapering class that the older style washing machine with an agitator is much better for cloth than the newer front loaders. We've definitely found this to be true! Our house came with an old washer that works great. However, when we stayed with family and used their fancy new model without an agitator, our diapers held stains for the first time and just didn't get clean. I also should mention that different diapers may have different washing instructions. Some brands may not be this low maintenance. Always check labels! 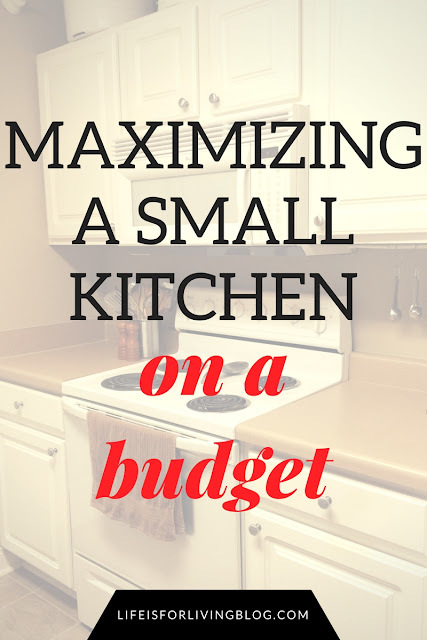 It seems like we're always driving long distances and staying overnight with family, or even just making trips around town that turn into a big ordeal when you have a baby on board. You'd think using cloth on the road would be a hassle, right? I mean, I once said: "I can do cloth at home, but what about when we travel? We'll use disposables for that." Then I learned about an amazing invention called the wet bag. 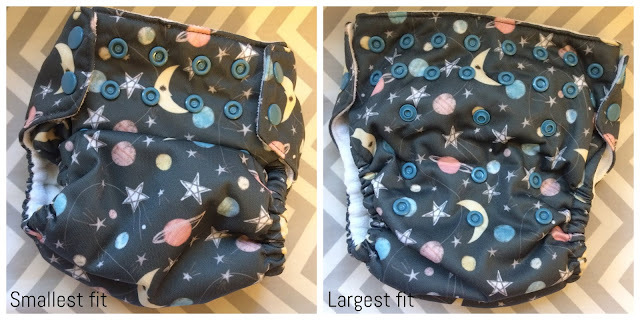 We keep two medium Thirsties wet bags folded up in our diaper bag, along with four cloth diapers. We loooooove the farm print. It's so adorable! You'll also notice in my diaper bag photo that we have a pack of Water Wipes in there for now. I bought one pack before we decided to go with cloth wipes, so we're using them in the bag until they run out. After that, we'll switch to cloth and Baby Bits in there as well. And that pretty much wraps it up! We're immensely pleased with cloth, and I will preach about them to anyone who'll listen. Every time I dump our diapers into the washing machine, I see the pile and think about how many disposables we'd be adding to the landfill if we hadn't made this choice. It really is a no-brainer! 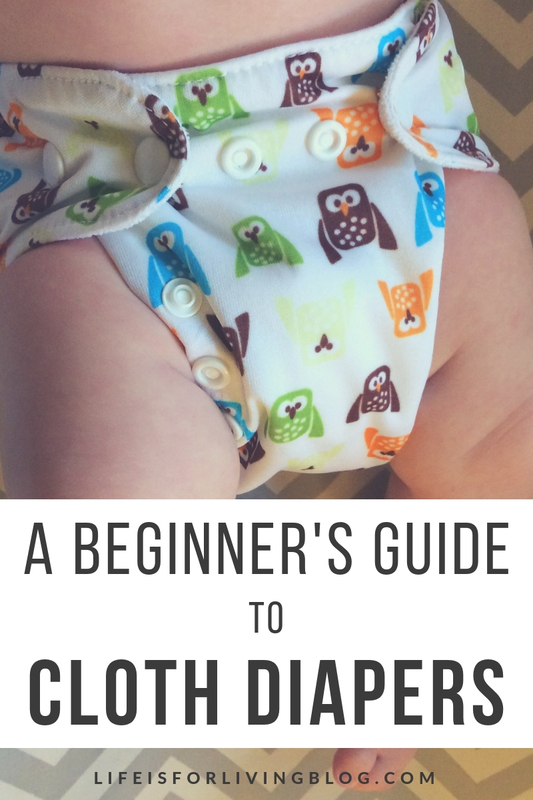 Thank you for writing about cloth diapering! This has been the most straight forward explanation of diapering systems that I've come across. Are you still happy with the brand/styles you mentioned? Any other advice you'd throw in since you've been immersed in diapering?